This is a two part experience. The first illustrates the concept of escape velocity. The team picks and launches a rocket for a Mars mission. Watch as the rocket takes and see if can escape earth’s gravity pull. Students can ten vary the size and mass of earth to see how that affects escape velocity and therefore rocket of choice. The second part deals with plantary orbits. Explore how orbital motion changes with variables like planet size and mass and discover how day and night or the seasons occur due to planetary motion. Students enter or verify their name and chooses either the Gravity Quest or Solar Sandbox modes. 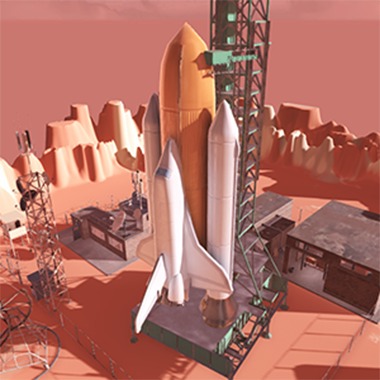 In Gravity Quest mode, the students will see a Rocket Base where they will be briefed on the mission and objectives. They will have to pick a rocket for their mission from a selection of rockets of different weights and thrusts. The students will also have to add the payload to their rocket. Once ready, the rocket is launched and the students can see how the rocket accelerates and if it reaches escape velocity. The students can also adjust earth’s size/mass to see how that impacts the choice of rocket due to the change to the planet’s gravity. In Solar Sandbox mode, the team will see a Mixed Reality solar system. The students can observe planetary orbit around the sun. The can pause orbit motion and rotation. Students can also change planet size and mass on the various orbital path and see how that affects the orbit parameters. Students will be able to collect data during the MR experience which they will receive at the end of the sessions. Students will be given a 5 minute brief on how to put on and use the hololens and an outline of the Holosphere 2 Mixed Reality experience.